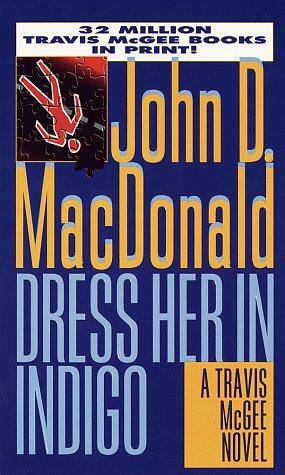 One phrase struck me during the reading of this book, another in the 20-odd series featuring everybody's favourite sexual healer Travis McGee, that reminded me of the fantastic lashing John D MacD got at the hands of another reviewer, and if which I made copious use in a previous review. Another of Trav's mysteriously well-connected contacts puts him on to one Enelio Fuentes, whose comportment around women is degraded at best, and whose own sensibilities lead him to pimp out two typists to Trav and hirsute pal Meyer during their stay in Oaxaca, something to which neither of them object. He repeatedly describes women as either crumpets or chicklets, and Meyer later relates that when he presses Fuentes for the distinction, it's beguilingly vague and horribly sexist at the same time - I'll leave that for you to find and enjoy. So why do I persist in reading what some might describe as novels that demean the reader as well as the women (and men) portrayed therein? In short, because they're great fun. Even as MacDonald bucks the trend of the casual stereotyping of Mexicans as slovenly and untrustworthy with upwardly mobile and successful characters like the lovely chicklets / crumpets Elena, Lita and Margarita (one of whom Fuentes takes for himself) and Fuentes himself, a VW agency owner and member of an elite social club on the roof of some ghastly modern structure, he also appears to have a pretty tight grip on the reality of a particular time and place, of some pretty real human emotions, and an understanding of the fluidity of situations and encounters that never once leave you suspicious or mistrustful of what comes next. I often will myself to dislike his prose and to flare up the old snorts of derision at some trite or hackneyed narrative trope but find myself equally often unable so to do. MacDonald is a pretty damned good writer, even if he leaves a fur of bitter distaste on the tongues of many. And in ...Indigo MacDonald has a cracking story, about the disintegration of middle American ideals and the seeking of meaning in a Mexican pipe dream, as well as a tale of deceit and death that really does pull you in and sock you in the jaw. And the lovely Lady Rebecca? Just wow. That's all.